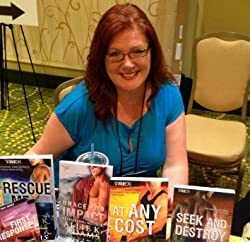 Allie K. Adams is the USA Today bestselling author of several award-winning stories, including the TREX romantic suspense series. An active member of the search and rescue, as well as previously served as a reserve deputy, Allie has firsthand experience in most of the dangers she writes about. Known for her deeply intense, heart-racing suspenses and spine-tingling thrillers, she can be found most days in front of her computer, saving the world one sizzling story at a time. She grew up in Seattle and now currently lives in southwest Montana with her husband and various other wildlife. Please enter your email address and click the Follow button to follow Allie K. Adams! Sometimes the trouble with love is timing…but for Amy Stevens and Nathan Jepson, this Valentine's Day is finally theirs.